Sea otters are an endangered species of animal that are currently protected by State and Federal laws. I was asked to share this information from an organization called "Friends of the Sea Otters" with my animal-loving readers. The Friends of the Sea Otters want to inform people about the Sea Otters' behaviors, habitat, and to recover this species of animal from the endangered list. If you're still thinking of gift ideas, here are a few suggestions from Friends of the Sea Otters. The following is a guest post written by Jim Curland and Frank Reynolds. There are several opportunities to help contribute to conserving sea otters and their populations this holiday season! Friends of the Sea Otter is involved in these efforts to make giving during the holidays a "win-win" situation for sea otters. The Monterey County Gives campaign during this holiday season runs from mid-November through midnight December 31 and is a way to stretch your donation further through a portion of your contribution getting matched by the Community Foundation of Monterey partnering with the Monterey County Weekly for this campaign. Thanks to the matching fund, your donation can have a bigger impact to Friends of the Sea Otter and to helping protect sea otters and their habitat. Click here to view our donation page. Using Amazon for your holiday shopping? Want to help protect sea otters for no extra charge while purchasing gifts? Share a Gift and Help Sea Otters! Friends of the Sea Otter is the world’s oldest sea otter organization dedicated to conserving sea otters and their habitats. Your purchase in the gift store will be used in support of Friends of the Sea Otter’s efforts to protect sea otters and their habitat in a number of ways. You can buy individual gifts or purchase our gift bundles as a membership package. We have a select number of bundles, each with their own unique gifts. Your donation will go towards Friends of the Sea Otter’s mission to conserve sea otters and their habitat. If you would like to make a donation, but would not like to receive a gift please use the donate button at the top. T-shirt from Friends of the Sea Otter Zazzle store. 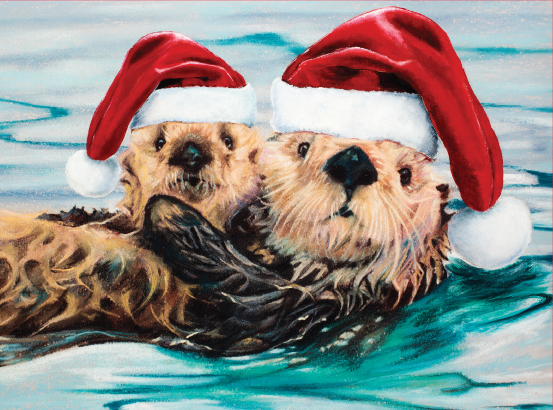 If you are looking to buy someone that special gift for the holidays, there are a variety of items in Friends of the Sea Otter’s Zazzle Storefront. Many of the items were designed using specially made artwork by Kelly Lance, done exclusively for Friends of the Sea Otter. And, if you are still decorating the Christmas tree, be sure and check out the Christmas ornament in the store. A percentage of your purchase in our Zazzle Storefront will go towards Friends of the Sea Otter’s mission to conserve sea otters and their habitat. Oh Sea Otters are so cute! Great ideas. Sea otters are the kids' favorites to see! They are very cute. Have a tremendous Thursday. California sea otters are so much fun to watch and remarkable marine mammals. For any bloggers who don't know, their numbers have been very slowly declining again (from around 3000) and as far as I know a reason hasn't been pinpointed. In the early 20th century they were believed extinct, but a small group was found in Big Sur and that was how the subspecies was brought back from the brink. I will look into this group and its work. Thanks for the information Ann! And thank you for the information Amy! I was unaware of what you shared! I love seat otters! This is great information! That is something that I would like to see Easy! Thank you for sharing this great cause Ann! I didn't knew that Sea Otters where endangered too. That is so upsetting! They are such lovely animals. I will make shure to share this on Twitter immediately to help get the word across! No need to apologize Francesca. It's a busy time of year and especially busy for you! That is some good information and hope they can raise some money for those sea otters. Thanks for this info. Take care. Thank you Marg, I do too.